This product provides an insider's perspective on venture capital and the future of the business. 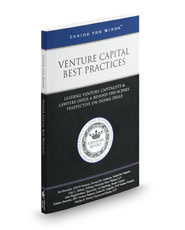 It examines venture capital deals from both an investor's and a legal perspective, offering proven strategies for valuing a company, raising capital, working with management teams, and exiting an investment. Topics covered include conducting due diligence, strategies for negotiating deal terms, evaluating growth potential, and minimizing risk.